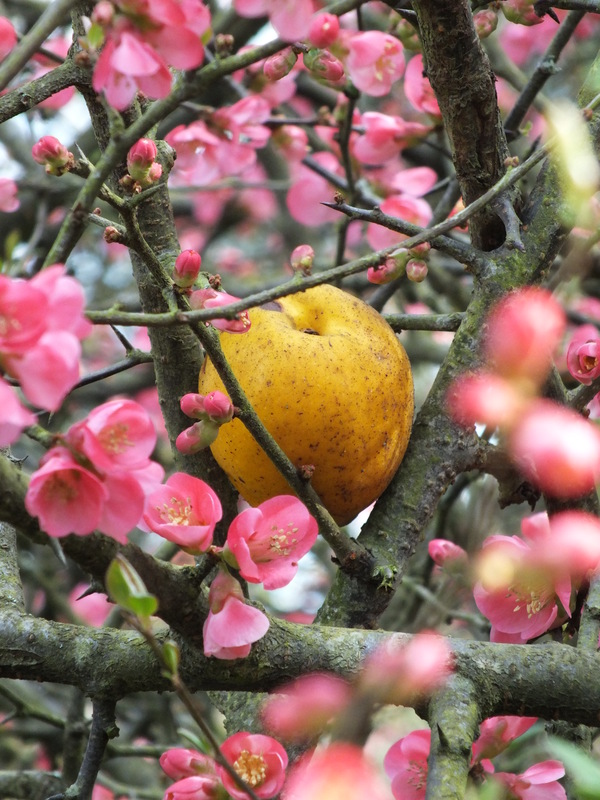 Chaenomeles – Japonica to you and me…. 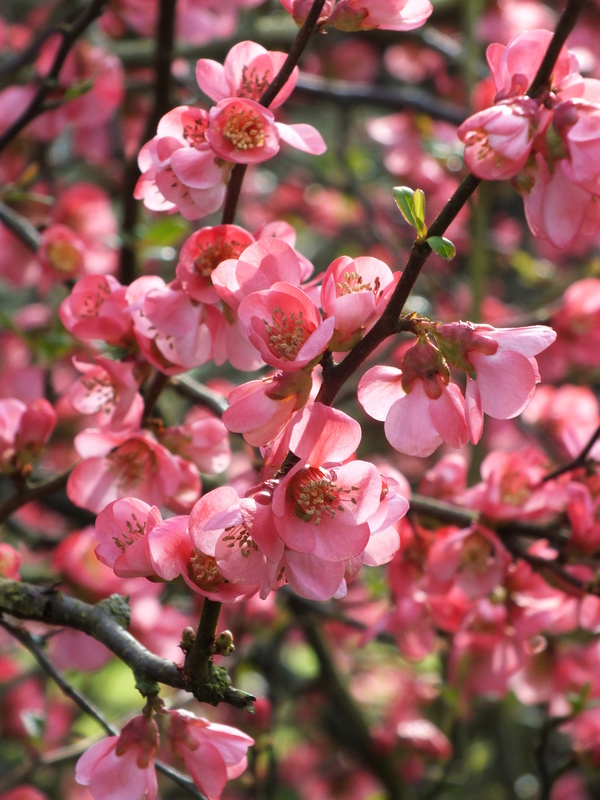 The scarlet Chaenomeles speciosa sits within the Japanese Landscape under the Chokushi-Mon and grabs the eye! The camellias are dropping their spent flowers across the carefully raked gravel – which admittedly has some appeal – but the flowering quince keeps a tight hold of their waxy flowers and is an altogether tidier affair. Not green, not yet, of course, but they have Impact. 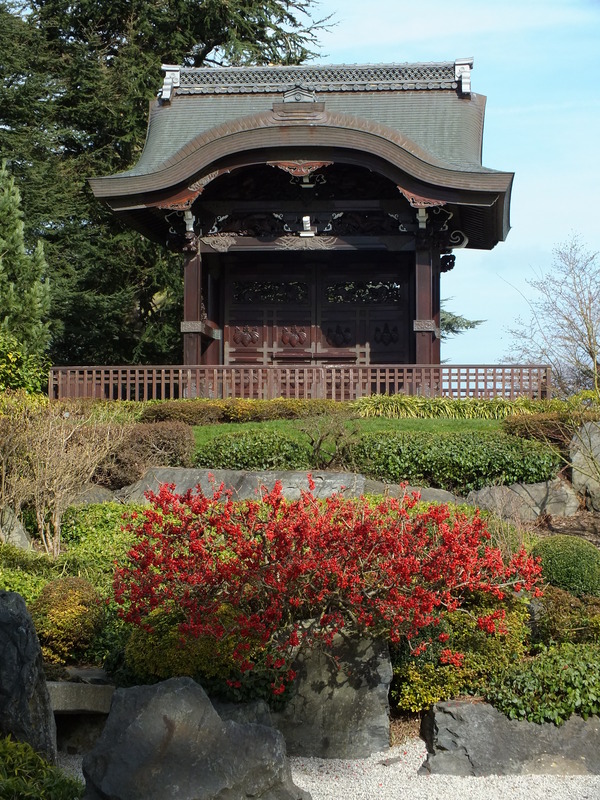 Checking back on my last entry from the Japanese Landscape, I can see that the first scarlet flowers were out on 20th January 2014 – which makes for quite a long period of interest! Japonica is what most of us persist in calling all the Chaenomeles (though older gardeners may remember them as Cydonia because botanists used to think they had more in common with quinces than pears). Joseph Banks introduced the shrub as Pyrus japonica at the end of the 18th century. It was a native of China, but had been cultivated for years in Japan. Now we know it as Chaenomeles speciosa – Chaenomeles means gaping apple. That’s botany for you. Chaenomeles japonica arrived here almost a century later. 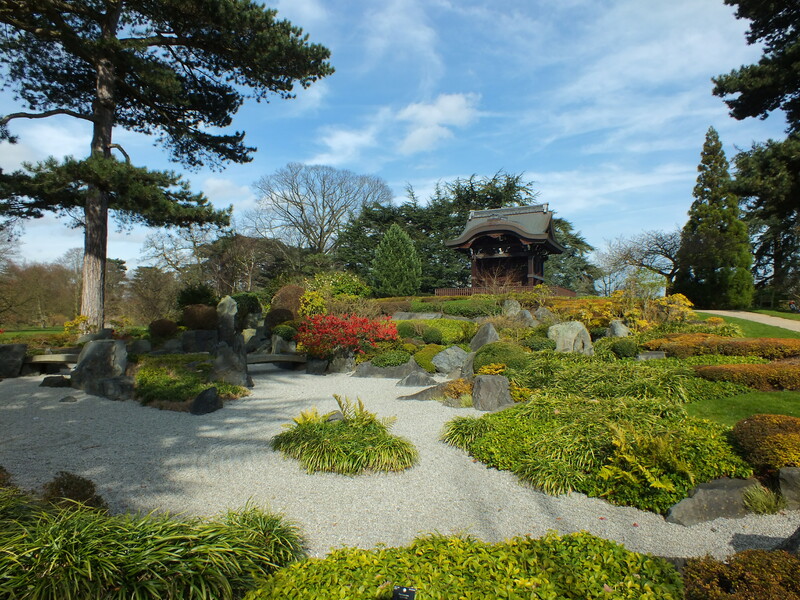 It grew wild in Japan and was introduced to this country by a Bristol nursery, W Maule & Son. It is small and suckering, less useful in the garden than the descendants of C. speciosa, but it does have very pretty round, scented, orange fruit to follow the scarlet flowers. Crosses between speciosa and japonica are grouped under C. x superba. 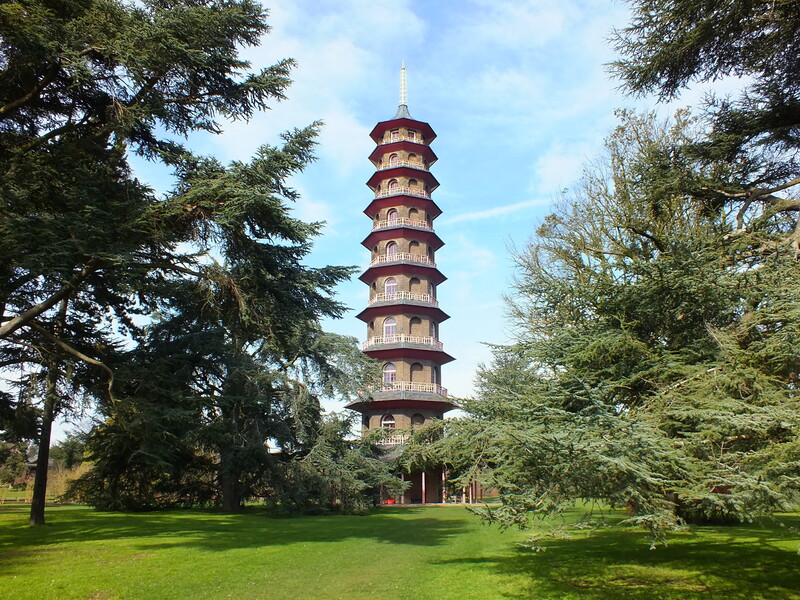 Early Victorians were mad about japonicas and grew them as standards, which might be worth trying in pots. They tend now to be used as wall shrubs or open bushes and are particularly useful for those who cannot grow camellias. And their early flowers are one of the first glamorous treats of spring. The named speciosa variety ‘Moerloosei’ is sometimes called ‘Apple Blossom’. It has large white flowers that are coral pink in bud and they open a couple of months sooner than any apple tree. ‘Nivalis’ is a good white speciosa, best seen against a dark hedge or a brick wall. Both of these are large. On a wall they will reach 6ft fast and in the open they make big spreading bushes. The hybrids between speciosa and japonica are more biddable. The best forms have the brilliance of their japonica parent. ‘Rowallane’ has been around since the early years of the last century and it is still a first-class plant with big bright-red flowers. ‘Crimson and Gold’ is a darker red with a gold middle. It is inclined to sucker but makes a good hedge. If you like orange tones try the Victorian ‘Knap Hill Scarlet’ which is more of a flame red. Gardeners who dislike strong colours may prefer the greenish ‘Lemon and Lime’. All Chaenomeles have fruit in autumn. Not many it is true, but you can make jam from them if you are so inclined. Alice Coates in Garden Shrubs and their Histories describes a tea party during the First World War for which the Rev J J Jacob made jelly from six different varieties of Chaenomeles speciosa. The best pot was pronounced as good as guava jelly from the West Indies. 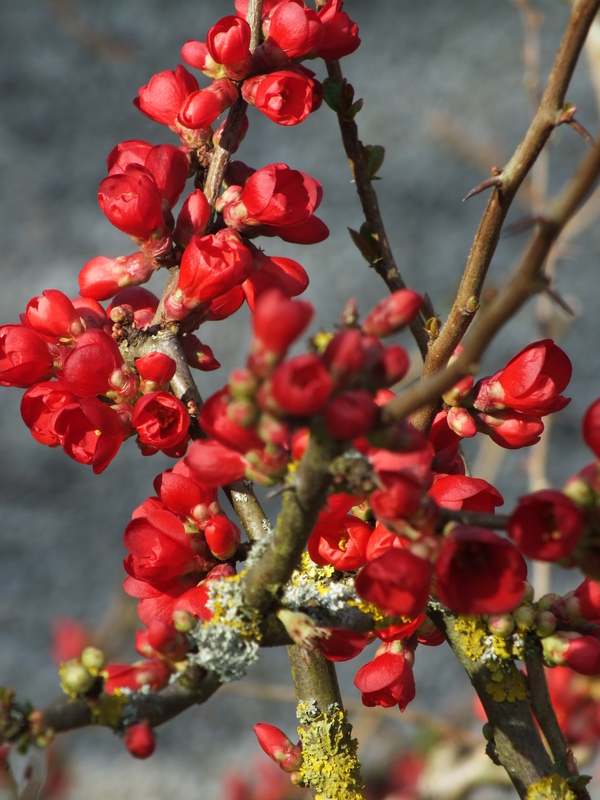 Chaenomeles can be grown in the open as a bush on any fertile soil. They prefer neutral conditions but can cope with lime. Heavy clays should have grit added. They can be grown in sun or shade but will probably flower better with a bit of sun. They also bear more flowers as well-trained wall shrubs. Grow them as fans or espaliers as you might an apple or pear tree. Once the horizontal framework is established, prune the side growths back to a couple of buds in summer. 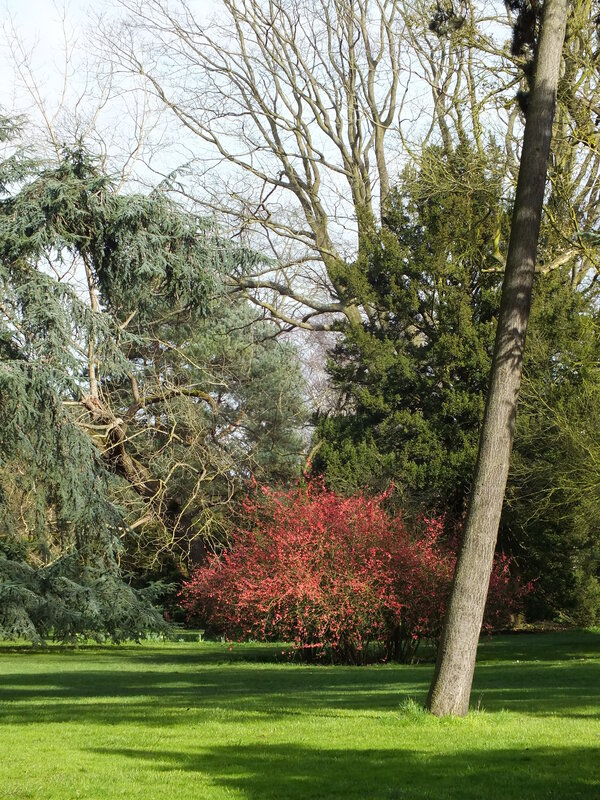 Chaenomeles are at their best planted with Clematis alpina. ‘Willy’ is a good small-flowered pink partner for ‘Moerloosei’. ‘Frances Rivis’ is larger and blue. Under the strong reds, the greeny golds of Euphorbia robbiae or the slightly more tender C. ‘Portuguese Velvet’ look good.